WARREN — Three members of Trumbull Neighborhood Partnership and the Trumbull County Land Bank were recognized for their work during the Ohio Community Development Corporations Association 34th annual conference last weekend in Columbus. TNP’s Miles Johnson won the association’s “Rising Star” award for his ongoing work with youth in Trumbull and Mahoning counties, including the Junior Organizers Reach One Train One mentorship program. Junior Organizers is a group of young people, ages 16 to 19, learning to to organize around neighborhood blight, racial equity, food access, crime and poverty. Korey Gall and Mikenna McClurg received the Ned D. Neuhausel Housing Award for getting more than 225 Land Bank houses sold at below market value to vulnerable individuals who committed to remain in them for at least three years. TNP’s work with the county land bank won the Community Development Partner of the Year award. 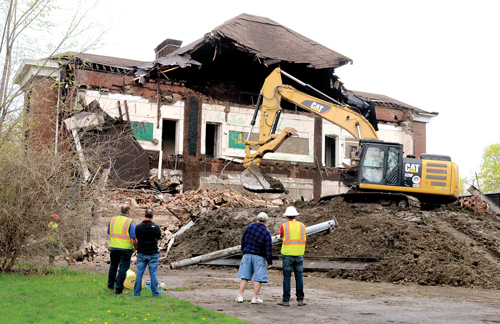 Its work with the Trumbull County Land Reutilization Corporation has led to the demolition of hundreds of properties in the county. Nate Coffman, executive director of of the OCDCA, said the work TNP has done has been impressive because it has been able to make a significant difference in Trumbull County even though it has only existed for a few years.